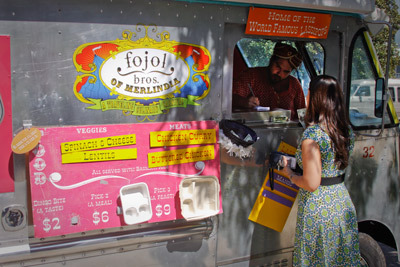 The eclectic cuisine of the Fojol Brothers food truck could come to J Street, an employee said this week. The Indian-Ethiopian-Thai fusion eatery, known for its turban and fake-mustache-wearing employees, is in talks with GW about joining the dining hall this spring. J Street would be the first brick-and-mortar location for the “traveling culinary carnival,” which frequents H Street during lunch and dinner hours. “The administrators, they liked the spice, they liked the flavors and we liked their flavors. So hopefully if everybody’s flavors jive well in the cooking pot, then we can get this thing served and ready to eat,” Andrew Bucket, a Fojol Brothers employee who wears a paint-splattered jumpsuit and floppy hat, and who calls himself “Nukaloo,” said Tuesday. Owner and founder Justin Vitarello, who goes by the name “Dingo,” declined to comment, and allowed Bucket to confirm the talks on behalf of the company. The Fojol Brothers run three food trucks across the District, featuring food from three made-up countries. The campus dining office has overhauled J Street’s options in the last two years, replacing restaurants like Chik-fil-A and Wendy’s last fall to add Sodexo venues. But since then, Sodexo was swapped in three other non-Sodexo restaurants – Aroma, Auntie Anne’s Pretzels and the Vietnamese eatery BONMi. Singh said he wants to stay in J Street, citing strong sales and a lively customer base. Director of Campus Support Services Nancy Haaga declined to confirm the addition of a new vendor or say if any other vendors would be moved out. “It’s our job to constantly be looking at what’s offered and what that participation is and how the students or customers are enjoying it,” Haaga said.